If you've been looking for sustainable way to maintain healthy eating and optimal weight long-term, not a quick fix that will get you into your skinny jeans temporarily, then balancing eating for nourishment with eating for pleasure ( including dessert), is the key ingredient to support you in your efforts in our abundant food and stress environment. Diets that are devoid of pleasure and joy may work in the short term, but over time it can impact your relationship with food and create all sorts of unwanted behaviors from having an all or nothing eating approach to slipping into patterns of binge eating and/or overeating. How to start changing your relationships with desserts? When we change some of our thinking patterns, we're able to experience pleasure without guilt and still eat more optimal choices most of the day while enjoying the occasional treat. In other words, you can have your cake and eat it, too...and if you want to be fit after 40 , you already know that food quality over quantity is you eating mantra – so, make it with high quality, nutrient-dense and unrefined ingredients and then enjoy it mindfully. Food is not "good" and "bad" and something that you "deserve". Saying never and don't just makes you want it more. Thinking that you need to deprive yourself in order to be healthy can lead to unwanted behaviors around food and will most likely set you up for failure. Finding the healthiest version to satisfy your sweet tooth is not an impossible feat. 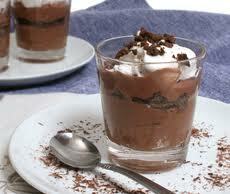 See the Healthy Avocado Chocolate Mousse recipe below to start. Enjoying the "real deal" on occasion is part of any sustainable healthy living and successful aging plan, but it only works when you eat without guilt and truly savor every morsel. Practice mindful eating strategies so that you can not only enjoy your dessert fully, but also learn to tune into the wisdom of your body. 1. Soak the dates in the milk or water for 10-30 minutes to soften. In a blender, add the avocado flesh, dates, milk, vanilla and salt and cacao powder. Blend until smooth. You may need a little more liquid to facilitate blending and scrape down the sides of the jug a few times. 2. Adjust ingredients to taste, adding more cacao powder if it needs it. Serve and garnish with your choice of toppings.